When each of the ultra-luxury suites at Sabi Sabi has been completed, the finishing touch has been to give it a name which matches, or has relevance to, the lodge in which it has been built. Thus, the Amber Presidential Suite at Earth Lodge evokes the spirit of a lodge which reflects the mineral wealth of South Africa, and is a suite filled with beautiful amber beadwork. 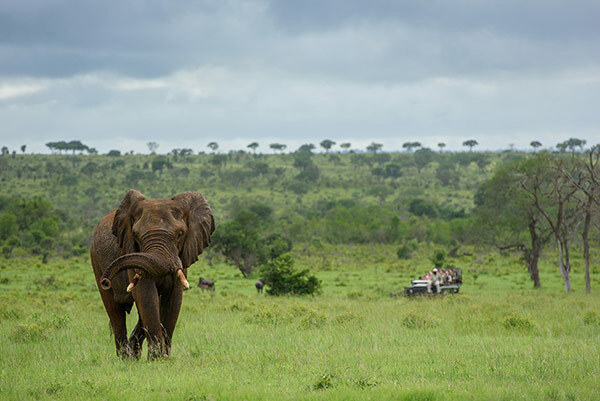 The Ivory Presidential Suite at Selati Camp reminds us that the camp is situated on an animal migratory path, a path that elephants follow day in and day out. The Mandleve Presidential Suite at Bush Lodge is in deference to the awe-inspiring great tusker of that name who spent much of his life wandering the bushveld of Sabi Sabi. When the two magnificent Bush Lodge Villas were completed, the challenge was what to name them. What sprang to mind was the sleek, sultry, great cat for which Sabi Sabi safaris are famous - the beautiful, elusive leopard. A highly territorial creature, the leopard is a "must see" for many guests. Two wonderful male leopards (Toms), have afforded visitors to our lodges spectacular sightings over the years. Mahlatini (meaning "thick bush") wandered onto our reserve many years ago, and made the dense undergrowth around Bush Lodge a favoured part of his territory. A shy leopard at the onset, Mahlatini developed into an exceptionally large male - a really prize specimen. He was dominant in his prime years, but admitted defeat to a much younger Tom, Maxabeni, the ruler of the Sabi Sabi leopard empire - for now. The sire of some of the most famous leopards in the Sabi Sand was a glorious male named "Tumbela". This leopard had a habit of digging warthogs out of their burrows, one of which eventually caused him serious injuries. Ironically he spent much of his recovery time resting inside a deserted warthog burrow. A prominent scar which left an indent on his right front paw made his spoor easily identifiable for our trackers. Leopards are lords of the bushveld. They enjoy peace and quiet between the exciting moments of their days. They savour their meals and relax in solitude when the mood so takes them. Our two luxury villas at Bush Lodge have fittingly been named after the great Mahlatini and Tumbela, symbolising glamour, opulence and seclusion. Each villa is extraordinarily expansive and feature two luxuriously appointed suites, each with an en-suite bathroom. The villas are sumptuously furnished, with a central lounge/library which extends through onto a huge reed-covered patio and private plunge pool. The master suite, with king size draped four-poster bed, leads into a dressing area featuring hide covered chairs and ottomans. A little further and one steps into a unique, palatial, floor to ceiling glass walled bathroom. The two side-by-side his and her baths have sliding windows opening to the outdoors. Outside, the al-fresco shower is almost invisible, tucked away in an indigenous tree. The second bedroom is also beautiful, with twin draped beds and comfortable cushioned window box seating to relax and watch the great outdoors. This bedroom features a private en-suite bathroom, which includes a bath and rain shower. The Mahlatini and Tumbela Villas are perfect getaway destinations for small families or couples travelling together. Children of all ages are well catered for at Bush Lodge and can enjoy the EleFun Centre, where activities are aimed at nurturing a deeper understanding and love for the surrounding bush. The exclusive use of a game drive vehicle, with a ranger and tracker team, is included in a booking at the exquisite Bush Lodge Villas. Crafted around natural Leadwood sculptures, the idyllic suites combine a respect for the environment with all the luxuries of a world class, 5-Star destination. Sabi Sabi Private Game Reserve is pleased to advise that we will be attending the following travel shows, taking place in South Africa. Jacques Smit, Jan Scholtz and Carol Volkwyn will be representing Sabi Sabi for the full period in Cape Town. Please contact us to set up an appointment for Indaba or visit us at our stand (ICC - G03) to collect our new marketing material for 2017/2018. We look forward to seeing all our friends from far and wide. National Geographic Lodges of the World is more than a superior group of hotels. It is a collection of the world's most desirable experiences in iconic locations. This affiliation is not an expression of quality measurement, such as a five-star rating - it is a seal of authenticity and a reflection of shared values. National Geographic Unique Lodges of the World members are devoted to making a positive impact on local communities and are proven leaders in sustainable tourism practices. Sabi Sabi Earth Lodge has been a proud member of the National Geographic Unique Lodges of the World, since its inception in January 2015. We are extremely pleased to announce that the entire collection of Sabi Sabi's Lodges has now joined this prestigious brand - with our four 5-star lodges having received the National Geographic Unique Lodges of the World stamp of approval, distinguishing our iconic lodges and attesting to the fact that we meet the highest international standards in terms of experience, authenticity and sustainability. Sabi Sabi is committed to conservation of not only the environment we live in, but also our intrinsic community and cultures. We have a long-standing relationship with adjacent communities, and through tourism endeavours we can continue to assist and invest in the very homes, schools and villages from where our staff originate. Being family owned since 1979, Sabi Sabi proudly boasts the experience of offering a "luxury home in the bush". This is only possible with the pride and passion shown by those who call Sabi Sabi home and those who unite luxury, adventure and safari. We follow strict ethics of eco-tourism as custodians of this land, and through sustainable efforts protect and maintain this wilderness in its natural form. Our interpretation of the bush and its wonder stems from our respect for the fauna and flora in this unique part of the world. Our aim is to have guests departing from Sabi Sabi with a sense of appreciation for conservation and how they, too, can be part of our journey and commitment to linking community, hospitality and conservation - an approach we have successfully followed for almost four decades. The selection process to be awarded as a member of the renowned National Geographic brand is rigorous. An acclaimed accessor of the brand visits our lodges for an audit, ensuring that each lodge offers an outstanding guest experience, while supporting the protection of cultural and natural heritage and embracing sustainable tourism practices. We are proud of this continued illustrious association, and pledge our commitment to the protection of resources and wilderness areas for future generations. Sabi Sabi, together with National Geographic, will continue to unite Conservation, Community and Tourism. Sabi Sabi is one of only four National Geographic Unique Lodges of the World situated in South Africa. Sabi Sabi Private Game Reserve successfully implemented the Guest Conservation Contribution (GCC) on the 1st March 2016, collecting this voluntary donation on behalf of the Sabi Sand Wildtuin (SSW). We wish to thank you for all your support and for being part of such an impactful contribution. We are proud to say that our Trade Partners showed their commitment to conservation and, together with our guests, have raised substantial amounts in the past year, which all benefit our highly successful anti-poaching efforts in our area. Efforts that have seen records lows of rhinos lost, and slowly but surely we are winning the battle against poaching! - The GCC fee will be charged at R114-00 per person per night. Due to VAT implications, an additional R14 is added in order to not detract from funds toward the GCC. Please note that the maximum payment per guest is restricted to 3 days - so the maximum per person charge would be R300-00 plus VAT - R342-00. - The new fee is valid for incremental business with immediate effect, for travel from the 1st March 2017. - Any reservations confirmed before this time will not incur the additional fee and Sabi Sabi will absorb the difference. - As per normal, all invoicing will be done at source, unless otherwise instructed by our trade partners. The funds contributed have gone a long way in the current conservation efforts by the SSW, and will continue to be utilised for anti-poaching and general conservation initiatives. Please follow this link for the SSW information brochure, which is a detailed outline of how these funds are allocated. We thank you for your valuable assistance in this regard and look forward to your continued support. Earth Lodge is a masterpiece....with remarkable, innovative architecture which is art in itself. In 2011, the lodge was completely renovated to reflect the mineral wealth and glory of South Africa, and more recently our design team were tasked with adding and blending in a few more subtle touches to further enhance the already magnificent design. The lodge was already a beautiful study of metallic hues and earthy tones, but the new soft furnishings, specially commissioned lighting and glorious relaxation areas have been masterfully blended into the original design. Not wanting to change too much of the already amazing mould - the lodge is so cleverly sculpted into the earth that elephants wander onto the rooftop - ingenious decorative pieces have been added. In the bar area magnificent hand-blown glass globes in various amber tones combine to produce a stunning chandelier that takes centre stage, and unique hand-crafted magnifying glass candle holders create an unusual and eye-catching feature for those enjoying a pre-dinner drink. New, comfortable chairs in varying shades and textures are a tactile and visual delight. Artfully chosen eclectic outdoor furniture grouped to create special quiet spaces are a wonderful outdoor enhancement for the suites. The underground wine cellar has been remodelled to open up the space and better showcase the restyled alcoves housing Sabi Sabi's impressive collection of award winning wines and champagnes. Gently lit by masses of candles on a metal chandelier, the master crafted wooden banquet table and beautifully upholstered chairs create a perfect setting for private dining, wine tasting or special occasions. Being at one with nature is core to the Earth Lodge philosophy, and a stunning new sunken fire pit lounge is the perfect addition as a place to relax and soak in the sights and sounds of Africa at night. The circular recessed hollow, alluringly placed overlooking a lit water feature, allows guests to chat quietly around a blazing log fire, marvel at the canopy of stars overhead and indulge in a delicious nightcap before retiring for the evening. The designers did not feel the necessity of bringing clutter into this organic space. The additions were to highlight the fascinating way natural light plays with the time of day and to bring the focus back to the uniqueness of the lodge - the raw wood hand-sculpted pieces by Geoffrey Armstrong, the use of metallic 'African' colours throughout, the rough textures of the unadorned walls and ceilings. Put simply - Earth Lodge needs no fuss - this lodge's remarkable architecture is inherently its own work of art. More than 35 years ago, the concept of Bush Lodge was just a dream, an idea of designing a home in the bush and a warm, hospitable experience for visitors from around the world. The creators of this vision were Hilton and Jacqui Loon, one a pragmatic businessman, the other a talented artist, both of whom loved the excitement of travelling. The new Bush Lodge takes you on a breath-taking expedition through Africa, celebrating the adventures of the Loons, and their love for Africa, its people, its art and culture. Designers, Derrick Tabbert Interiors and Design Republic, were tasked with bringing these explorations to life and the result is a masterful amalgamation of ideas and design. This is truly the Africa of "Today". Arriving into the reception area the journey already begins. A custom-made heavily carved wooden reception desk evokes images of wealthy Arabic traders from Northern Africa. On the other side a magnificent oversized Chesterfield couch, upholstered in green and crackled gold leather, sits in pride of place atop a black and white tiled floor, a nod to colonial travellers of the 1900's.The green touches, together with white and black, are a repeated colour focus weaving all the new décor together. Walking from reception through the atrium towards the safari lounge, enormous brass and canvas lamps shine light upwards illuminating the high thatch and downwards onto a mass of overlapping colourful Persian and woven rugs, green vintage stools and leather tables, plus an eclectic collection of original paintings, objets d'art and artefacts, which adorn the walls. The bar with its incredible mix of décor is an unexpected "mash up" of styles which somehow just work. Once again the black and white floor appears, together with touches of old green on intimate seating arrangements of tub chairs, leather bar stools and collectible Ardmore wing backs. A close inspection reveals that the new bar with its smooth wooden top is actually clad in copper - showcasing a collection of South African craft beers, craft gins and boutique wines. There are so many interesting ornaments but the pieces which takes pride of place are the glass fronted steel and brass whisky cabinets and the massive, beaded, calabash-shaped chandelier hanging from the high ceiling beams. An extension of the enormous thatch roof spans the beautiful "indoor/outdoor" dining area and extends over the huge viewing deck and safari lounge, wonderful spots to kick back and watch animals meandering down to the waterhole. The deck features comfortable seat groupings of various styles of chairs and couches atop Persian rugs, and a fascinating collection of carved wooden tables from many African cultures. The centrepiece chandelier, suspended from the beams of the viewing deck, is a fascinating mix of hand-woven, mismatched baskets which have been repurposed into lights. A few steps away the safari lounge has a more sophisticated, chic feel, with enormous round leather ottomans, built-in seating covered with leather bolsters and African scatter cushions. Antique wooden benches, interesting carved coffee tables and West African stools complete the picture. This fabulous revamp follows the recent introduction of the ultra-luxurious 2 bedroom Villas, the renovations within the Mandleve Presidential suite and the luxury suites. Bush Lodge has become a veritable museum, an homage to the customs of Africa, a history of Jacqui and Hilton's exploration and a celebration of their vision and passion for Africa. Please contact natalie@amgltd.biz for new images. The transformation of Sabi Sabi Little Bush Camp is complete. In the Sabi Sabi Lodges' design philosophy with Selati Camp being "Yesterday", Bush Lodge "Today" and Earth Lodge "Tomorrow", Little Bush Camp is now the transition between the traditional, but eclectic Bush Lodge and the contemporary, more modern Earth Lodge. The re-creation of this stunning, intimate camp began with the recent renovation of its 6 luxurious suites into a masterpiece of comfort and beauty. African inspired accommodation with an unimpeded flow of space which creates a magnificent illusion of bringing the outdoors into the indoors was just the start of the major revamp of Little Bush Camp. Talented designers Derrick Tabbert Interiors and Design Republic, were tasked with re-designing the central reception, lounge and dining areas. They had, as their canvas, the dramatic architecture of the main building - a sweeping high thatched roof with huge wooden beams cover the entire structure, the open sided walls supported by massive logs. The entire frontage creates a glorious frame through which to view the bushveld beyond. For more infomation, and jawdropping see the new images of this transformation, please visit Sabi Sabi's website. Growing up in a big, busy family and living in a small community village adjacent to the Sabi Sand Wildtuin, the Mkansi family learned a deep love and respect for their environment and almost all have made a career close to their roots. Life was very different then and they fondly recall trips to Skukuza on the old steam train that ran along the (now disused) Selati railway line; reminisce about the veterinary fence that separated the Sabi Sand from Kruger Park; and even remember a time before Sabi Sabi was created. Lawrence, in particular, remembers how his father used to cycle along the Selati railway line way back when. Eight of the Mkansi family members now work at Sabi Sabi, each with a different focus, yet each with a continued passion for working with people in their beloved bushveld. Visitors to Sabi Sabi are familiar with the impressive sight of the tall, broad-shouldered brothers, Lawrence, Phios and Louis, who are all long-term employees at the lodges. Phios and Louis are expert trackers, most at home out in the open on safari sharing their vast knowledge with guests and giving them an insight into the rich cultural heritage of the local Shangaan people. Lawrence has come a long way since joining Sabi Sabi as a gardener 20 years ago. His path to Bush Lodge Assistant Lodge Manager and Group Head Ranger has seen him work as a Night Watchman, Bar Tender, Waiter, Tracker and Senior Ranger. And while he is now on the management team, there is nothing he likes better than being back at the helm of a safari vehicle reliving his guiding days with the reserve's myriad wildlife species. Sisters Petunia and Patricia fulfil support roles at Bush Lodge, while Lindiwe, Anna and Salvation are part of the Selati Camp team. Although eight family members working together is rare, there are many examples at Sabi Sabi of siblings, parents, cousins and other relatives all working together. It's not surprising given that the reserve was started as a family business and retains strong family ties to this day. This is part of what makes Sabi Sabi special and unique and why visitors instantly feel at home, enveloped in the warm African hospitality for which the reserve is renowned. Meet some of our wonderful Mkansi's in this video - Lawrence, Petunia and Patricia. They are a closely knit family and exemplify the bonds that are very much part of the Sabi Sabi ethos. When two iconic families join forces, the result can only be described as spectacular! This is true of the successful collaboration between Sabi Sabi Private Game Reserve and the Stellenrust Estate in Stellenbosch, a relationship which has lasted for many years. Sabi Sabi is famous for over 35 years of safari excellence while Stellenrust, one of the largest family-owned estates in Stellenbosch, has been operating since 1928. Having Stellenrust wines as the Sabi Sabi lodge wines was a natural choice and this relationship was cemented in 2010. The two family-owned brands share many of the same principles that make them both leaders in their respective fields - community upliftment, true hospitality and a passion for, and commitment to their environment and their people. Innovation runs through both families, and in 2012 Sabi Sabi and Stellenrust came together at harvest time and took a calculated risk, deciding to experiment with a "Bush Maturation" process - an undertaking that seemed impossible and with naysayers saying it would never work! Bush maturation meant maturing wine in a somewhat tropical climate but within a controlled environment. The process - as overwhelming as it was - was accomplished with the transportation and subsequent proper tapping of the wine into two 225 litre French oak barrels. These were housed in the Sabi Sabi Earth Lodge wine cellar at a temperate 18˚C - one barrel containing a Shiraz and the other a Cabernet Sauvignon. Not knowing what the end results would be, samples were regularly sent to Stellenrust for testing and they were given a consistent thumbs up. The culmination of this pioneering journey was celebrated at the end of June 2016 with the bottling of these wines. And what better way to share this occasion than by inviting a niche group of journalists and friends to witness this resounding success! Stellenrust and Sabi Sabi hosted the event and spent many hours bottling the wine from the two barrels using an ancient and authentic hand press method. This proved to be messy at times, but a huge amount of fun was had accompanied by much laughter. Everyone was given the opportunity to manually fill their bottles, followed by the corking, capsulating and labelling of the bounty with a specially designed label. The final sampling was undertaken and both cultivars were deemed worthy to be part of the Earth Lodge Private Collection - hand-bottled on site and ear-marked to stand the test of time. In essence, the message from the cellarmaster at Stellenrust was "this wine has aged beautifully and gives tremendous drinking pleasure". Coupled with this historic event, Sabi Sabi's Earth Lodge provided a gastronomic feast of exceptional dining, fine wines and inimitable 5-star hospitality. Only South African wines are stocked in the cavernous Earth Lodge wine cellar, and a detailed selection process is undertaken when choosing the best of the best - unique wines to complement a unique experience. Boutique style wineries that produce award-winning wines take pride of place on the Sabi Sabi wine list - one of the reasons why Sabi Sabi was recently awarded 2-stars on "The Best Wine Lists in the World - 2016".